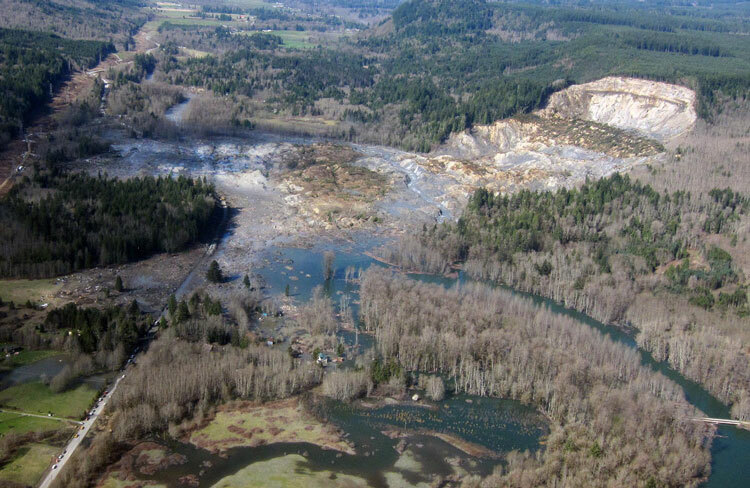 Reston, Va. — The Oso landslide, also known as the SR 530 landslide, occurred in northwest Washington state on March 22, 2014, leading to devastating loss of life and destruction of property. Landslide debris blocked the North Fork Stillaguamish River, destroyed about 40 homes and other structures, and buried nearly a mile of State Route 530. Most tragically, it caused 43 fatalities in the community of Steelhead Haven near Oso, Washington. USGS published research includes maps showing the relative ages of landslides similar in style and geographically near Oso, models that showed how quickly the landside mobilized, and information about the expected response of the North Fork Stillaguamish River to the ongoing erosion of the millions of tons of material deposited as a result of the landslide. USGS researchers are now nearing the conclusion of a five-year study that mapped the landslide in detail in order to understand the mobility of the event — that is, to understand why the landslide traveled so far. The Oso landslide involved a complex sequence of geological and hydrological events that ultimately resulted in a debris-avalanche flow. USGS research indicates that the landslide traveled exceptionally far, crossing the entire one-half-mile wide river valley. Research has also shown that heavy seasonal precipitation likely contributed to destabilizing the slope. In fact, precipitation in the area during February and March of 2014 was 150 to 200 percent of the long-term average. USGS, working with the University of Washington, University of California, Los Angeles, NOAA, and other partners, published findings that revealed that the time of year in which the seasonal total precipitation had occurred was relevant to triggering the landslide — heavy precipitation occurred toward the end of the rainy season when the ground was already nearly saturated. Another USGS study revealed how models can help explain the travel distance and timing of these types of landslides, which, in turn, can help us improve landslide susceptibility maps for such events in the future. Landslides occur in all 50 states and U.S. territories and on average cause $1 billion to $2 billion in damages and more than 25 fatalities each year.